At the opening of the 113th edition of the Rolex Monte Carlo Masters, eleven of the best players participating in the Tournament had the immense privilege of being received by HSH Prince Sovereign Albert II at the Prince’s Palace. Accompanied by Baroness Elizabeth-Ann Massy, ​​President of the Tournament Organizing Committee, and Melanie Massy, ​​the players were welcomed at 16:30. After visiting the Throne Room and discovering the Cistern Palace, they were able to exchange the Sovereign Prince’s sumptuous ice cream parlor for a cocktail party. 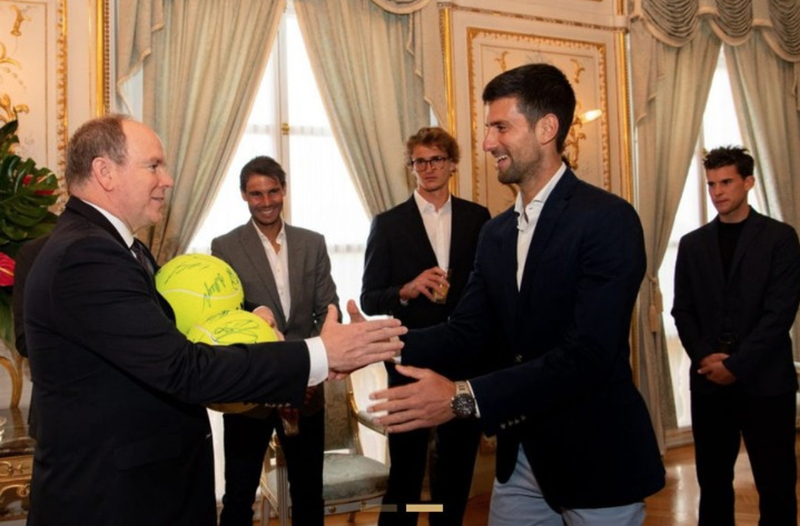 Novak Djokovic, ATP number 1 and resident of Monaco, presented the Sovereign Prince with two balls signed by all players for SAS Hereditary Prince Jacques and SAS Princess Gabriella. It was so nice and such an honor to visit the royal family in the Monaco castle with my fellow players today – Photo by @alexzverev123 via Instagram.